If you’ve ever wondered what manual handling is or what the regulations for manual handling are, then this post is for you. More importantly, it highlights the manual handling TILE acronym and how to implement this within your organisation. These regulations were developed to help your organisation reduce the number of Musculoskeletal Disorders (MSDs), associated with Manual Handling, which is the most commonly reported type of work-related ill health. Every organisation has potentially harmful manual handling tasks and our manual handling statistics infographic illustrates why manual handling plays such a central role in occupational safety. These regulations demonstrate a hierarchy of measures that will help you manage your manual handling risks. Third – Reduce the risk of injury so far as it is reasonably practicable. To help you assess manual handling risks, combat MSDs and implement the hierarchy of measures a number of different tools are available such as the MAC tool, manual handling risk assessment based on the TILEO acronym (schedule 1 of the MHOR 1992), DVDs, publications, guidance documents and manual handling training – such as train the trainer. The manual handling TILEO acronym can be used to assess each manual handling activity within your own organisation. The acronym ‘TILEO’ stands for TASK, INDIVIDUAL, LOAD, ENVIRONMENT and OTHER FACTORS and will help your organisation conduct dynamic risk assessments or on the spot assessments. When a detailed risk assessment is conducted, it should take account of both the relevant physical and psychosocial factors contained in Schedule 1 of the MHOR. A manual handling risk assessment will identify a number of hazards and TILEO can be used. The role of the dynamic risk assessments is to identify hazards that may appear on a day-to-day basis due to the changing nature of the work being undertaken and therefore you should train your workforce to consider TILEO before they do any manual handling. These risk assessments do not need to be written down as they form part of handlers’ good working practice. Handlers must observe their surroundings and take appropriate action to reduce or eliminate risks that would have not been foreseeable as part of the manual handling risk assessment. 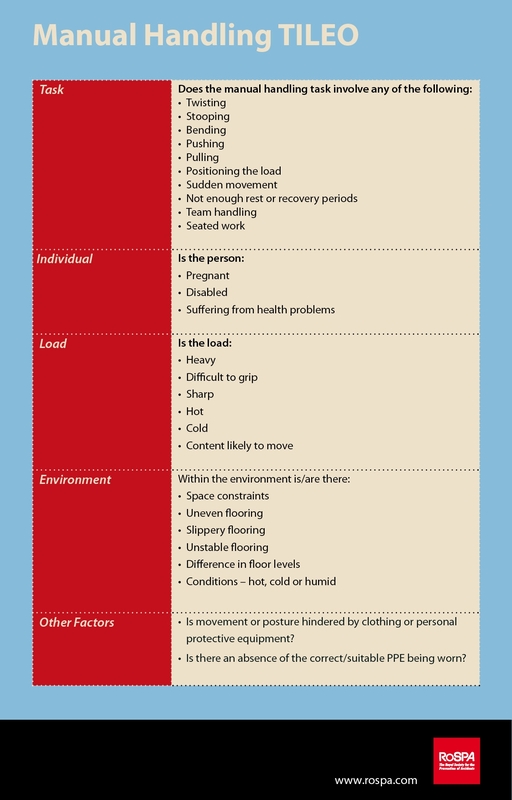 The table below demonstrates how the manual handling TILEO can be used to assess each manual handling activity within your own organisation and how TILEO can be used to conduct an on the spot assessment, which allows you to ‘Think Before You Lift’ or ‘Plan a Lift’. I hope this post has given you more insight into manual handling, please feel free to discuss this information or post more specific information below.